Why would you want to wear a dinosaur or pumpkin skin when you could represent your favorite football team instead? This is a strange question that Fortnite players will soon be asking themselves when the NFL skins appear in the game on November 9. Popular Fortnite players like Ninja showed them off during their livestreams today. 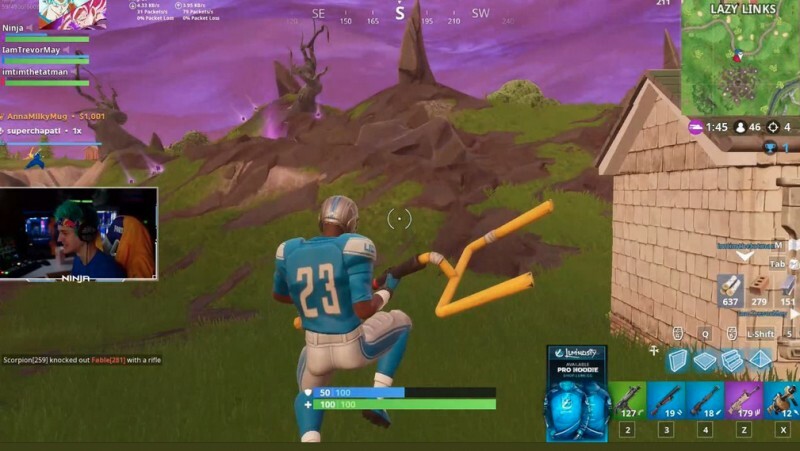 Ninja, who is a huge Detroit Lions fan, was decked out in the team’s iconic silver and blue, and teamed up with ImTimtheTatman, who wore Dallas Cowboys gear. When the skins are purchased, the player can select any team and number for any match. So if you start out by wearing a Miami Dolphins skin with the number 22, your next match could be as a Chicago Bear with number 45. The skins that are being sold feature three distinct looks for both male and female avatars. As you can see from the image below, you can round out the football look with a goal post melee item.